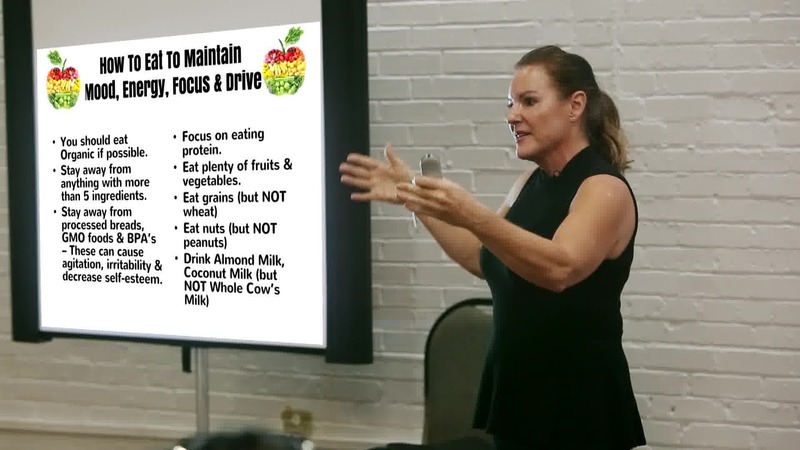 There are several keys to eating to maintain mood, energy, focus and drive, through optimum nutrition. 1. BUY ORGANIC: A good rule of thumb for buying organic (if you cannot afford to go ALL organic) is if the food has delicate skin (such as: lettuce, tomatoes, berries, etc.) buy organic. Meats and dairy products are another place to “splurge”. These items are a good start for transitioning to an all organic diet. 2. BUY WHOLE WHEAT BREAD: When purchasing breads, look for “whole grains” or “100% whole wheat flour” on the ingredient list – This should be the first ingredient and the ONLY flour type in the product. 4. BUY WILD CAUGHT vs. FARM RAISED: Farm raised fish are fed hormones which help the fish “grow” larger, but these very same hormones can be toxic. Wild caught fish are a better choice – and if you buy the whole fish instead, you can cut down some of the cost. 5. AVOID MSG: This additive is found in many “ready-made” items (ex. : sauces, dressings, mixes, etc.). Some companies use terms like “natural flavor”, “vegetable flavoring” or “flavor enhancers”. To make certain that you are not consuming MSG, instead make your sauces or dressings at home, from your own ingredients. 6. AVOID “LIQUID” CALORIES: Water is always the best option. Avoid juices and sodas (these contain high sugar and calorie contents), not to mention all of the artificial colors and flavors in most. If you are craving juice, try making your own at home with your favorite fruits and veggies. Eating organic foods help reduce your body’s toxin burden. By choosing organic food, you can reduce the pesticide build up in your body. Pesticides and herbicides are toxic by nature and if your diet chronically exposes you to these toxins, then it becomes dangerous to your health. Organic foods are also GMO-Free. GMO’s (Genetically Modified Organisms) are plants or animals that have been created by combining DNA from different species to create a new organism. These are not healthy for human consumption due to the evidence showing the risks of GMOs out-weighing the benefits. Overall, organic is better for you and the Earth; pollution from irresponsible agriculture farming is one of the largest factors in the U.S. affecting water quality of rivers and lakes. Buying organic helps support the responsible farmers and supports our planet. 1. Pick seasonal fruits and vegetables – this ensures that you are getting the freshest and healthiest produce. 2. Examine your produce – avoid glossy or shiny produce. Look for colorful fruits and vegetables, but you do not want to purchase something that looks like it came straight from a photo shopped picture. Do not be scared off by imperfections, speckles or spots; this means that your produce was grown as naturally as possible. 3. Use your sense of touch – “firm” should be one of your keywords when shopping for organic produce. Apples, bananas, tomatoes, and cabbage should all feel firm to the touch. Leafy produce should appear crisp and feel “springy” when slightly squeezed. 4. Use your sense of smell – this is one of the most important things to remember when selecting organic produce. You want the food to smell fresh (depending on the type of food, this means: sweet, earthy, herbal, etc.). If you are purchasing produce in advance, be sure and select the food that smells the faintest compared to the others, this will allow time to ripen. 1. Eat your protein first – high protein intake can decrease the “hunger hormone”, making you feel fuller and more satisfied. 2. Snack on protein – chips, pretzels and crackers are very low in protein. Choose something like 1oz. cheese cubes for a filling snack that is high in calcium and protein. 3. Replace your cereal – while oatmeal contains more protein than other cereals (approx. 6g in a 1 cup serving), eggs can provide much more (approx. 16g in 3 eggs). This can help you feel fuller and eat less calories. 4.Use almonds as a topping – almonds are incredibly healthy because they are high in healthy fats, vitamins and protein. Try topping your salad, yogurt, cottage cheese, or oatmeal to boost your protein consumption. 5. Choose lean meats – by choosing less fatty meat cuts and slightly increasing the portion size, you can easily incorporate more protein into every meal. There are a number of ways that processed foods can negatively affect your health. One of the most obvious ways these types of food affect your body is increased sugar consumption. Processed foods have a ton of added sugar, which is harmful to your metabolism. This can result in over-eating processed foods, releasing chemicals into our brains, making us “feel good” - this is known as the “food reward hypothesis of obesity”. Another way processed foods are harming our bodies are through all of the added preservatives, colorants and chemical flavorings; causing people to physically become addicted to these types of foods. Most of the nutrients in processed foods have been lost, and are then replaced with artificial additives. These do not break-down or metabolize the same as regular nutrients. There are many benefits of a grain-free diet, but the “anti-Alzheimer’s trio”, when it comes to eating foods for brain health or memory, there is no better trio than: coconut oil, grass-fed beef, and avocados. The trios of high fat, brain smart foods are important for any diet. Other benefits of going grain-free are improved mood, reduced anxiety, lifted mind-fog, enhanced learning, aide in reversal of neurological impairment and possible prevention of dementia. Keep going for that healthy brain through your optimum nutrition plan. For more information or to make an appointment with Doctor Teresa Jones, give us a call! You whole health matters of us and we are here to help!